It is not possible to make money transfers overseas online, from UK-based banks. So what are you going to do if you are an overseas-based scammer desperate to make some cash – and not have the money trail lead directly back to you? Recruit an unsuspecting money mule! Money mules are people who, often without any knowledge of what they are doing, help transfer, or launder, money outside the country. In today’s economic climate, most money mules – also known as money transfer agents – are people recruited to transfer money gained through “phishing” or Trojan virus online scams, which gain access to people’s banking and other passwords through illicit methods. The money mules receive the money gained by ill-gotten means into their bank accounts, then transfer it overseas. In return, they are paid a small fee, or commission, by the perpetrators of the fraud. Scammers need to recruit money mules to transfer their funds; otherwise they have no way of actually getting to the money. The easiest way to get the cash is to recruit a series of money mules, often through spamming people’s email accounts. An example is this spam email, purportedly from a UK-based researcher working in West Africa. It asked for help transferring funds to a US-counterpart, ostensibly to avoid the time and other constraints involved in hiring a full-time accountant. “These payments are in Money Orders or Checks and they would be written out to you in your name and sent to you via courier, so all you need do is process the payments, then deduct your percentage and wire the rest back. 10 % from each operation!” the email said. The email then went on to ask for the individual’s personal details, such as name, occupation, date of birth, address and email address. Later, they would be asked to supply their banking details as well. Becoming a money mule is dangerous work, even if you are unaware you are doing anything illegal. As the money trail will lead directly back to you, you will be the one on the foul side of the law, should the scam be found out. Be aware that no legitimate company would recruit people to carry out financial transactions involving large sums of money over the Web. Would you send thousands of pounds to someone you had never met face-to-face before? Look at the email – like the one listed above, often the grammar, spelling, punctuation and word choice is far below par. 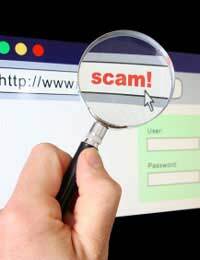 More sophisticated scammers, however, choose to replicate email sites of legitimate companies. If you receive an email asking you to transfermoney from a business you know, contact them directly to see if the email is legit. It won't be. Legitimate businesses would not need to hire someone from out of nowhere to transfer payments for them – why would they? In the same vein, why would a legitimate business pay an employee a percentage of their profits to transfer their money out of the country? It just doesn’t work that way. If you receive any email that looks like a money mule scam, delete it immediately. And if you have inadvertently disclosed any of your banking details – or sent or received any funds - contact your bank at once. If the transaction is illegal, as all forms of money laundering are, you could be held responsible – even if you had no idea you were doing anything wrong.